Historians have a bit of a problem with titles. Usually there’s some editor to rein them in, but in this medium I am unfettered. I will endeavour not to abuse my liberty and where I fail I hope at least to entertain. It is a rather odd and disparate collection of items to tackle in a single post. And I can hear the very first comment from every reader: “why isn’t it 2/3ds?” Not only will I link the three, but I can promise that my maths are intentional and necessary. In brief, two key themes unite these three on their path to historical wisdom. The first is that seemingly insignificant, quotidian matters of military history, warfare and combat experience can actually convey much that is important. Such evidences, even when irreverent, can yield wisdom. But they are not the details usually of concern to the historian — at least not much beyond their charm as an anecdote for colour and texture. The second is that people matter. Their ingenuity, and its value to war, cannot be replicated by technology or doctrine or diktat. The wisdom found and discussed in this piece arises out of minor anecdotes specifically dealing with relatively insignificant matters historically. I shall not only rescue these from obscurity, but also send out a relief call on behalf of those which languish still. The title worked best in its order, but for the discussion here the sequence of the narrative will put Happiness at the end. Although the author’s emotional response to the event is clear, the article offers nothing more than a narrative of the event itself, an official memorial to an important tale bound for obscurity only for its scope. Seemingly irrelevant, and obscured from the probing view of scholarly review, I would argue, in fact, that the surface insignificance defines its importance. The anecdote is the sort which perfectly embodies Lord Wavell’s advice to Liddell-Hart to study the daily things — of war, combat, and the soldier’s experience — as the most profitable path to historical scholarship. This, the experience from his military career taught him, was the superior means to understand war and its component parts could. In combat, small things, acts of “heroic imagination,” have incalculable effect upon the course of events. Where war promises to create seemingly significant shortfalls, how success has ever been achieved can be explained by the mysterious ingenuity of individuals under duress. The inspiration necessary to remedy the 2/6th shortfall can only come from the human element. It is the repair of vehicles on campaign with duct tape and baling wire when the spare parts are scarce, and every other act of ingenuity derring do. Wavell’s advice, obvious on the matter of the quotidian or seemingly irrelevant, also speaks inferentially to the tactical and strategic value of the individual’s seemingly mundane acts in war, either singly or in aggregation. It is very often the powerful small things that individuals do within the crucible of war and combat that make the difference. It was nearly dark by now, and Dodd had but a short time to observe these things. As twilight fell he picked his way up stream again and chose a lair for himself — a stony hollow in the side of the ravine, where he could rest. That night, just as on most of the other night and most of the days, it rained heavily and a cold wind blew. Dodd still, before going to sleep, found passing through his mind that old Biblical passage about foxes having holes and birds having nests. Yet if he had been asked — it is quite impossible, but assume it to have happened — if he were happy, he would not have known what to reply. He would have admitted readily enough that he was uncomfortable, that he was cold, and badly fed, and verminous; that his clothes were in rags, and his feet and knees and elbows raw and bleeding through much walking and crawling; that he was in ever-present peril of his life, and that he really did not expect to survive the adventure he was about to thrust himself into voluntarily, but all this had nothing to do with happiness: that was something he never stopped to think about. Perhaps the fact that he did not think about it proves he was happy. He was a soldier carrying out his duty as well as he knew how. He would have been the first to admit that under the wise direction of an officer what he had done and what he proposed to do might be more successful, but as it was he felt (or rather he would have felt if he had thought about it) he had nothing with which to reproach himself. And that condition is not at all far from true happiness. At the same time, he would have been utterly astonished if he had ever been told that some day a real printed book would devote paragraphs to the consideration of his frame of mind. In War, as in History, People and the Little Epic Things They Do Matter. Industrialization and information-based technologies have many convinced that the capabilities they will bring contain the means to a silver bullet to battlefield, theatre and geo-strategic dominance. This is unsupportable in the historical evidence and as a guide to decision-making potentially quite dangerous. Were that true the wheel would have ended war. Many millennia later, here we find ourselves, still fighting, having pursued relentless innovation of the means of war in the face of every seemingly insurmountable past advance. Nothing is magically going to make war easy. Don’t think like a jackass. The last post focused on the actions of generals, of commanders of armies. None would balk at an examination of their words, actions, and, of course, their importance, even if this meant a winding detour through some vaguely irrelevant letters. But when we descend to the level of the ranker, the question of defining the larger relevance looms as a toll we must pay. Furthermore, in this post, unlike the last with its focus upon the doings of armies and the conduct of wars, there are fewer than a dozen people involved and affected. Nevertheless, I would argue that the truths revealed in their small stories are of greater value than the lessons’ learned from Washington and Howe. While most military historians would blanch at an accusation that they did not value the wit, wisdom or experience of the average individual in war, in reality most scholarship does not rely upon this evidence. It cannot be helped, we are enamoured of the bright lights, the stars, the leaders, the big ideas, plans and campaigns, believing that those at the top must know the most, must be the most important, and must offer the greatest wisdom and insight to guide our understanding of past events. It seems that such sources offer proofs that are unassailable. Given all of the history that has ever been written, if our focus has always been too high and too keen to follow the big events, one is left wonder, and perhaps now regret, what has been overlooked or lost to our knowledge and understanding of the past and present because someone decided an event or action was too small for serious consideration. It seems impossible, but there must be very much out there waiting to be discovered. 1. 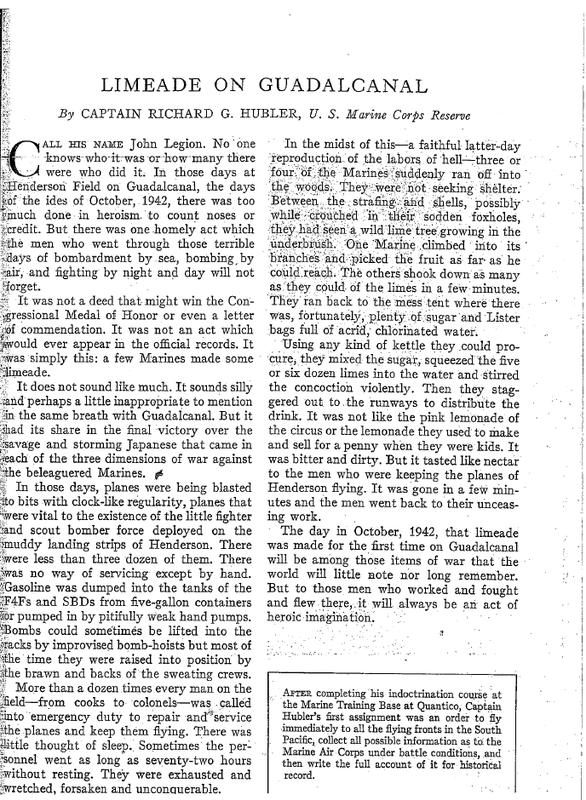 Captain Michael Hubler, USMC Reserves, “Limeade on Guadalcanal,” USNIP Vol. 70, #502, December 1944, p. 1501. 2. And, as my current research is concerned with subsistence in the American military tradition — a tributary of which includes the rankers’ efforts to improve their lot by ingenuity and shared treats — I found the article, especially the author’s desire to mark the event, to be quite pleasing to the points I hope to make. 3. At least, that is what I intend to claim here. As no determination on the long-term wisdom of my rule will be made before I am long gone I have every right to be bold. Stupid Clausewitz humour alert — all but the most intrepid flee. FROG and FICTION: I frequently err, and swap the “r” in the two as I think about them. As both remain words, it’s a bit dangerous, because while I’m not sure they would have been as famous or universally applicable, I am certain that Frog and Fiction can complicate war and battle. Yes, I do indulge myself a bit to say what I want here. 4. Art as opposed to the science of it. Art is the component of war that relies upon the human element. 5. Eric Hammel, Chosin: Heroic Ordeal of the Korean War, (New York: Vanguard Press, 1981) p. 349. 6. Thanks to a very smart WWI historian who pointed out the logistical merits of the static fronts after 1915. Of course, the societies were coming danger close, by war’s end, to having insufficient manpower resources. The near loss of an entire generation would have an indelible effect on the United Kingdom, France, Germany, Russia and to a lesser extent other combatants. Perhaps that’s the paradoxical lesson of unconstrained largesse in war — you will fight yourself to death if given half the chance. Sorry, there appears to be a lot of math in this for a historical essay. 7. NB: this is not an example of the importance of small things. It is an example of how single, human efforts can overcome seemingly impossible deficits. 8. Whatever else may be said of Ambrose’s histories, I cannot fault his paean to the soldiers’ inclinations and skills in these sorts of fixes on the battlefields of Europe. William Corson’s original concept for the Combined Action Program in Vietnam relied upon a similar proclivity and capacity of individuals to cobble together acceptable answers to the ordinary problems of rural South Vietnamese civilians. 9. C. S. Forester, Rifleman Dodd, Nautical Aviation Publishing Company of America: Mt. Pleasant, SC (2006), p. 125. 10. Current British Army recruitment advertising slogan: “Army: Be More. Do More.” Comparisons? Also, the ads are running on music video countdown shows. I suppose it’s no different than where an early 19th century “recruiter” would have made his personnel quota requirements. 11. General Victor Krulak as Commandant of the Marine Corps made it his choice as the book to be read by every member of that institution in 1996 (check) because of the paragon of service it depicted. The Dodd Standard: every Marine a rifleman, every Marine a Dodd.